Considering the President is the Commander-in-Chief of the military, he could LEGALLY have the armed forces step in to deal with the drug traffickers, the militia groups and other "troublemakers", thus CAN impose Martial Law upon his own country. And anyone can use Wiki, which is an unreliable source as anyone with an account can alter, modify or corrupt any of the entries. This thread is not for this type of discussion so DROP IT! Both of you, cool it. That's toeing the line for an overreaction, Tease. I advise you ignore the thread for a bit. Ches, that could have been a spot more tactful. Drop the argument; if you must continue, do it in another thread. Please, I'd rather no one fight on this forum, especially two that I talk to on a regular basis. Now, back to creepy things. Teasealot wrote: And anyone can use Wiki, which is an unreliable source as anyone with an account can alter, modify or corrupt any of the entries. The fact that you believe this to be true is pretty damn strange to me. Ever hear of the concept of "peer review"? I should have never posted that thing about the dream. There is no need to fight. There's an icecream truck, judging by the cutsie sing-song tune it plays (at least I hope it is, I've never actually seen it), that wanders around my area. The weird part is its hours. I was sitting here looking over some homework and I heard its song start up. I looked at my watch. It was 9:04 pm. And this is not unusual timing for it! Shachza wrote: Need moar creepy? I could see A clown driving the IceCream truck at night. I love clowns because a lot of people are scared of them. Im not but Its funny. I do this once a year on random days of october, I dress up as a clown. And scare my two friends Derek and Shane, they both have a cown phobia and run screaming like little children. I never understood it, why in the world people are scared of a funny character. I do not know, but Its funny as heck. And Clowns are meant to be scary, as their traditional job was to terrify away evil spirits, goblins, and monsters, and to scare possessin' demons out of you. So coulrophobia isn't a baseless fear. Clowns REALLY did go out of their way to scare you out of your minds. Also the Native Americans (the Utes to be precise) have a cannibalistic clown monster in their myths. And John Wayne Gacy, a serial killer dressed as a clown (he did children's parties as a job), he was even nicknamed Killer Clown. I allways look up what you people say to see if It's true. Tease you seem to be 100% correct. PS- Clowns don't seem freaky to me, but I allways have found a Circus It's self to be creepy. Only when empty however. You all may be relieved to know that it is indeed an icecream truck that is running around my area; I finally saw it this afternoon. Now I just need to figure out why an icecream truck would need to be active after dark. 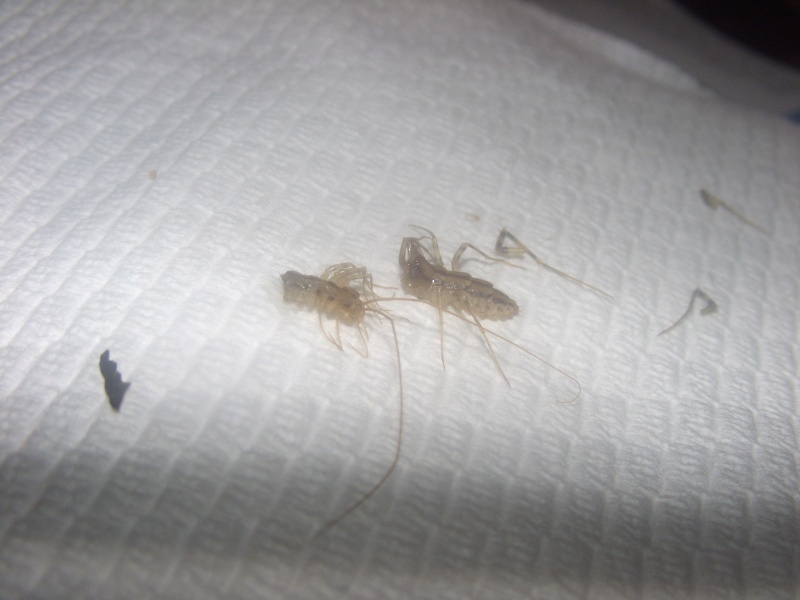 Killed a house centipede came running out of the bath tub! These things make me sick, even thoe they are almost harmless. I was so freaked I just slaughtered the thing. Does anyone know of products or home made goodies that can get arid of these things! Mecingo, you could try lavender oil/incense to fumigate them from your house. Lavender is a natural insect repellent so at the very least would chase out the centipedes' food source. Or you could lower the temperature in the house, and make the air dry with a dehumidifier... House centipedes don't like dry, cold environments so would likely move if the house became "uncomfortable* to them. Teasealot wrote: Mecingo, you could try lavender oil/incense to fumigate them from your house. Lavender is a natural insect repellent so at the very least would chase out the centipedes' food source. Also thinkin' about it, you didn't have to photograph the poor centipede's corpse... that's kinda morbid, and not in a gothic way. Teasealot wrote: Also thinkin' about it, you didn't have to photograph the poor centipede's corpse... that's kinda morbid, and not in a gothic way. I am Morbid, Im not totally proud of it. (If you wonder into pain and suffering too much you become morbid) The only that scares me about centipedes is their legs in a fast speed and that they chase me for some reason. I don't know why but the speed and legs creep scare me to the breaking point, If their not moving then I do not fear them, that happens in this case results their death. Yes I could have controlled posting the dead thing. It died quick, if that makes you feel any better. Their actually the only bug I fear, The only thing I fear. Millipedes are much slower so I don't have I fear of them. Im more scared of them then when my school got fired on, I wasn't even scared then. Something about their speed, and how it effects their legs. Their harmless I now, but my action of killing them is of fear for a weird reason. I don't know why I fear their method of moving, And I don't want to know if something else moves in that matter. Finding some material that looked like it came off of a bandage in a bag of Nutter Butter Bits, and worst was I was eating out of that bag. Night Dragon wrote: Finding some material that looked like it came off of a bandage in a bag of Nutter Butter Bits, and worst was I was eating out of that bag. That is creepy, did it taste funny? No, but I don't think that it was used for any medical reason, it was the material where normally the adhesive would be applied to a bandage. Before you ask, no there was no adhesive on the material, and I don't know what the material is called. 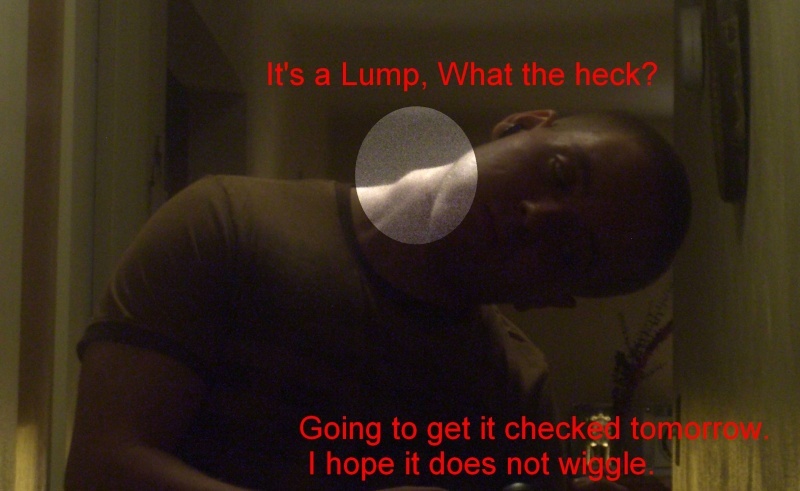 I random lump? On my neck. Strange. Edit: its not hard like muscle more like a bag of water feel. My mother noticed it when she came home today. I hate being me sometimes. Lord Grey II wrote: I hate being me sometimes. Never hate yourself, thinking like that will slow you down in life. Find what is great about yourself, and enjoy it. Mecingo wrote: I random lump? On my neck. Strange. Mecingo wrote: I was looking foward to this in my life, the pain would have been worth it and I could had added another set of tooth earings to my collection. While sittin' in the sushi bar today, me and Blackwolf heard a sound, it can only be described as the ear-splittin' squeal of a valley girl... only problem was it came from a GUY!